The Milwaukee Region is home to more than 4,100 high-tech, design and creative industry companies, employing more than 67,000 people. 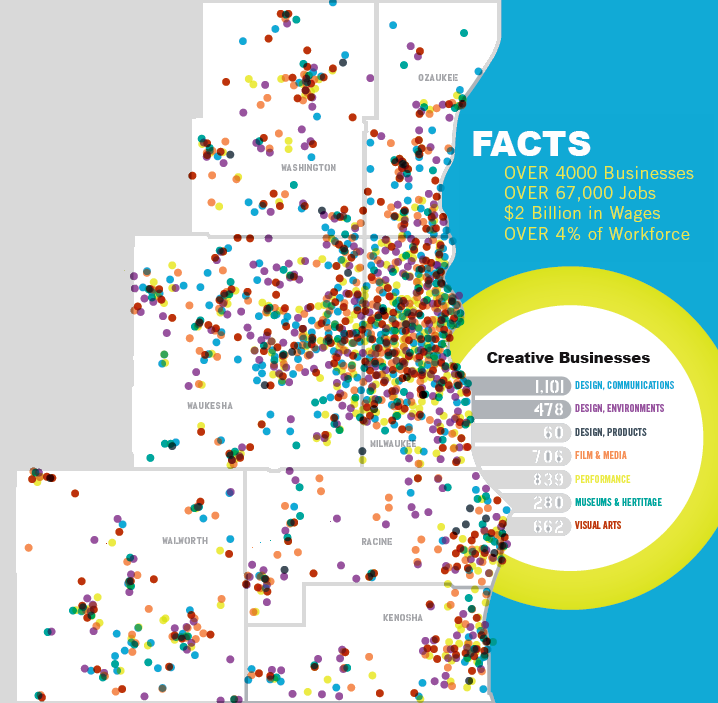 Companies in the region employ more creatives as a percentage of total employment — 4.2% — than Wisconsin as a whole (3.6%) or the national average (3.7%). About $2 billion in wages are earned by the region’s creative workers. Milwaukee's long history as a manufacturing mecca has built a legacy of creativity and innovation that continues to be fostered today. Milwaukee is fourth in the nation per capita for Fortune 500 companies that are constantly searching for innovative, creative talent. The region's post-secondary institutions are also developing innovative and collaborative efforts to teach and encourage design thinking. MiKE, or Innovation in Milwaukee, is an economic development cluster initiative focused on developin g high-tech talent at the intersection of design and technology. The initiative is also bringing innovation to existing companies and creating opportunity for start-ups in order to grow an already strong design technology community in the region. Ultimately, MiKE supports the design and technology cluster by cultivating a well-developed ecosystem or "habitat" that brings together art agencies, design firms, education, entrepreneurs, manufacturers and our global companies to focus on design and technology and enhance economic growth. Creative Alliance Milwaukee is also working to drive economic prosperity by growing the Milwaukee Region's creative industries and leveraging applied creativity in education, commerce, and culture. Its mission is to add jobs, small businesses and increased creative capacity in the region that will ultimately lead to more innovation.